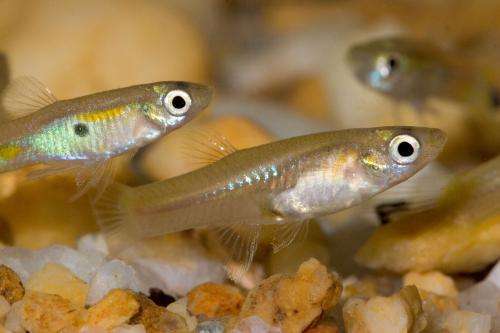 Performing experiments in a river in Trinidad, a team of evolutionary biologists has found that male guppies continue to reproduce for at least ten months after they die, living on as stored sperm in females, who have much longer lifespans (two years) than males (three-four months). "Populations that are too small can go extinct because close relatives end up breeding with each other and offspring suffer from inbreeding," said David Reznick, a professor of biology at the University of California, Riverside and the principal investigator of the research project. "If there are stored sperm, then the real population size is bigger than the number of animals you see. Also, stored sperm can increase genetic variation in other ways." Reznick explained that male guppies are brightly colored and very variable in coloration. Females prefer males with rare color patterns. A dead male with a long-lost color pattern can later give birth to a son who can now be preferred by females because he is different from all other males in the population. Because some females live so long, those sons can appear more than two generations after the father's death. "Adult female guppies are the strongest swimmers and now we know they are the best able to colonize new habitats," Reznick said. "Long term sperm storage means that a single female can colonize a new site and establish a new population that has a fair measure of genetic diversity since we have found that the older, larger females can carry the sperm of several males. Plants do the same sort of thing differently. They produce seeds that can lay dormant in the soil for decades so each year new offspring can appear that represent many prior generations of parents. Water fleas also lay eggs that can lie dormant for long intervals of time. But this is the first time we see such a phenomenon in a vertebrate." Study results appeared online June 5 in the Proceedings of the Royal Society B. While it is well known that guppies store sperm, Reznick and his team had never before thought of the extent of the storage. The experiments Reznick and colleagues conducted in Trinidad are part of a large-scale, interdisciplinary research program that is characterizing the interaction between ecological and evolutionary processes. "We are collecting these data for other reasons," Reznick said. "What we are learning is that such detailed data yield unexpected rewards. Very few studies have the kind of information that we are collecting—long-term mark recapture with genetics—so there is rarely the chance to make a discovery like this. What we are seeing seems rare because it has never before been reported, but it may only seem rare because almost no one has looked for it. It could be common and could play an important role in sustaining genetic diversity in natural populations."